Three bald eagles were shot and killed last month in an area south of Albany, and State Police are now seeking tips regarding the federal offense. On March 16, 2018, an Oregon State Police Fish and Wildlife Division Trooper responded to a complaint of the three deceased birds in the area of Tangent, Oregon, according to an OSP press release. 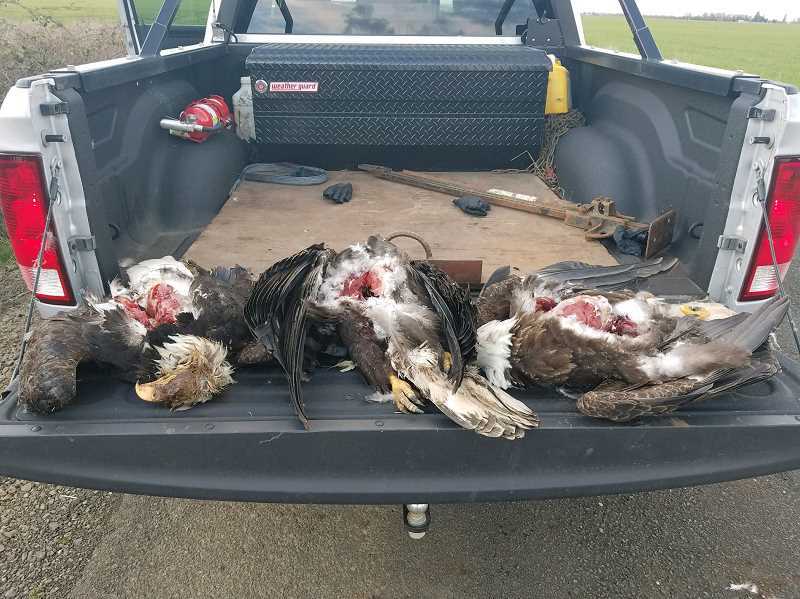 The trooper identified gunshot wounds on each bald eagle, and a veterinarian at the Oregon Department of Fish and Wildlife confirmed the cause of death through X-Rays, finding evidence of dense metal in each of the birds. Police have not identified any suspects in the case and do not have insight as to why someone killed the birds, according to OSP Public Information Officer Cari Boyd. There is no indication that it is a hate crime and no evidence for monetary motives as all parts were left intact. State and local organizations take crimes against bald eagles, the national bird of the United States, seriously. "We had a bald eagle that flew into a power line, unfortunately, and died," Boyd said. "We had to send it to a national repository so that they could distribute the parts to Native American people." In this case, the birds are being held as evidence, and will be sent to the repository if it's a viable effort at that point, according to Boyd. Several federal laws have been enacted to protect the bald eagle, which became endangered in 1967, per the US Fish and Wildlife Service. Bald eagles were removed from the list of threatened and endangered species in 2007, but remain protected under federal laws, including the Bald and Golden Eagle Protection Act, the Migratory Bird Treaty Act and the Lacey Act. The laws prohibit the taking, wounding, selling and more of bald eagles and/or other migratory birds. "Take" includes shooting at or killing the birds. Penalties for violating the laws range from a $5,000 fine up to a felony conviction with a $250,000 fine and five years of imprisonment. Boyd said that in this case, the charge would be "unlawful take of wildlife," a misdemeanor charge with a fine up to $6,250 and up to one year in jail.